Swing points are integral with the top swing beam, and supplied with our stainless steel swing fitting. Center post is made with a base plate ready for concrete foundation. Very cost effective swing construction. Strong and heavy construction makes this swing suitable for areas where vandalism is a consideration. Assembly and installation is quick and easy. Ideal for areas where space is limited. 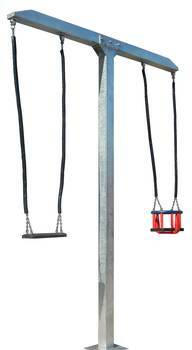 Safety area is typical smaller compared with traditional swing constructions. The packing of the unit is quite compact, and therefore transport friendly – Again cost effective.